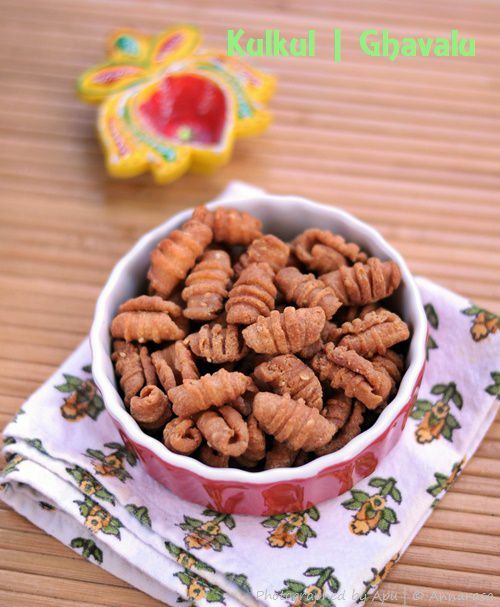 Namkeen Kulkul or Karam Ghavalu is a delicious snack that comes from Western India. My first introduction to Kulkul was in its sweet form. The spicy one I came to know of many years later. I love both forms of Kulkul and this Diwali I made the spicy one for family and friends. I love to add sesame seeds in Namkeens and I chose to add a good handful in this version of Kulkul. The result was really good - the Kulkul was crunchy with the seeds adding some extra flavor and texture to this snack. Mix the maida, rice flour, and sooji in a large mixing bowl. Add salt to taste, hing, and ghee to this mix. Using the tips of your fingers, rub the ghee into the flour mix. Now add the sesame seeds and mix to ensure even distribution. Add cold water slowly to make a malleable but stiff dough. Knead for 7 minutes, then set cover and allow to rest for at least 2 hours. When you are ready to fry the Kulkul, heat enough oil for seep frying in a heavy bottomed wok. Then reduce the heat to medium. Now pinch out very small amounts of the dough and shape into balls. Take one ball at a time and using your thumb, press it gently onto the back of a fork to shape as a shell. Repeat for all the dough. Deep fry a few Kulkul at a time on a very medium heat until they are golden and crisp. Remove onto a kitchen towel to drain the excess oil. Cool completely and store in an airtight box. Enjoy with hot tea or coffee. To make a vegan version, use 5 tbsp warmed oil in place of the ghee in this recipe. If you don't like sesame seeds, don't add them to the dough. Always fry Kulkul on a medium low heat to get a crunchy and crisp result.